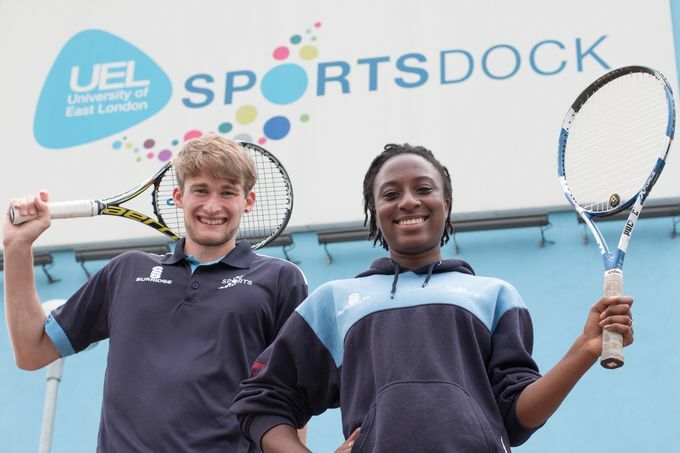 From modest beginnings, UEL is fast establishing itself as one of the UK’s leading universities for tennis. Six years ago tennis at UEL consisted of just one men’s team playing in the bottom division. Since then, the men’s team have enjoyed successive annual promotions, culminating in their elevation to the Premier division this year, while the women’s team have reached Division 1. They are now one of only nine universities in the UK to have been awarded ‘high performance’ status by the Tennis Foundation, the education arm of the Lawn Tennis Association. And what is more, the players get to play on state-of-the-art courts at the Queen Elizabeth Park in Stratford. “We’ve gone from having two players to a squad of 15,” says Richard Buscombe, UEL’s Head of Applied Sport and Exercise Sciences. “We would now rank in the top six universities in the UK. We are also, for the first time, in a position to offer the Advanced Apprenticeship in Sporting Excellence, building a pathway to university tennis for 16-18 year olds. It is quite an achievement given that the University that has no heritage in tennis, has no tennis courts of its own and is based in a borough with just one tennis club. But the UEL tennis programme still has access to enviable court facilities at the Queen Elizabeth Olympic Park, which hosted the wheelchair tennis tournament at the London 2012 Paralympics, and The Connaught Club in Chingford, Essex. Two of UEL’s current crop are Lewis Thompson, 20, from South Woodford, and Brielle Koulen, 21, from Hackney. Both are sports scholars, which gives them financial support and flexible study option to help them pursue their sporting ambitions while studying for a degree. Brielle is studying Applied Community Sports, a foundation degree delivered in collaboration with West Ham United Foundation, while Lewis is entering the third year of a Sports Development and Physical Education and Development degree. Lewis was invited by talent scouts to come and study at UEL. “As a teenager I did a lot of travelling around Europe playing tournaments, and at 18 I thought I’d take a gap year to see how well I did,” he said. As captain of UEL’s tennis team, Lewis is firmly focused on continuing the remarkable progress of UEL Tennis during the next academic year. “My ambition for the next year is to win the Premier division, do as well as we possibly can in the national cup and to try and get UEL Tennis in the top five rankings.